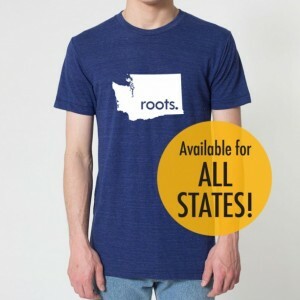 GOLD SERIES West Virginia WV Roots or Made Tri Blend Track T-Shirt - Unisex and Juniors Sizes XS - XXL A big part of who you are is where you're from - show your home state pride! This super-soft navy Tee is made by American Apparel in the USA - and decorated here as well by Seven Miles Per Second. We use a thin durable heat press vinyl transfer that looks virtually identical to screen printing. You'll love the soft flexibility and lasting quality of this tee for years to come. • Tri-Blend (50% Polyester / 25% Cotton / 25% Rayon) construction • Polyester retains shape and elasticity; Cotton lends both comfort and durability; addition of Rayon makes for a unique texture and drapes against the body for a slimming look • Durable rib neckband • Fits slimmer than our cotton American Apparel T-shirt • Unisex size – women may prefer to order one size down. • Please see chart at right to help determine your size. PLEASE SEE CHART IN LAST PHOTO LISTING TO DETERMINE YOUR SIZE. JUNIORS SIZES RUN ONE SIZE BELOW WHAT MANY BRANDS CARRY SO YOU MAY WANT TO ORDER AT LEAST ONE SIZE LARGER THAN YOU'D NORMALLY WEAR. We do our best to ship your tee as soon as possible. Because we print a variety of designs on multiple size and color tees, we may require up to 10 business days before shipping. We ship USPS First Class mail. Thank you for shopping in our store. We look forward to serving you! Roots and Made designs for ALL states are Copyright 2013, All Rights Reserved Seven Miles Per Second and may not be used or reproduced in any form without permission.